How to make money with clickbank will give you an overview of the different steps to making money online. There are many ways to make money online. But one of the easiest is Clickbank. Clickbank is a company that sells digital products and you can become an affiliate for no charge. It’s one o f the simplest way to earn money online without a large investment. Clickbank gives high commissions because most all their products are digital and are very easy to produce without any distribution costs. If you would like to join Clickbank it is very easy. Just go over to Clickbank.com, click into the signups form and fill out all the important information. There’s no waiting time to be approved and you can start looking for products right away. Click on Marketplace and it will bring up a list of categories, find a category that interest you, like a hobby or something that you have some knowledge of and interest in. Then looked in the subcategories and find something that you would like to promote. If you picked something like weight loss, narrow down you niche to something like “weight loss after 50” or “weight loss after having a baby”, you will find plenty of products to target. Find a product that looks profitable. The marketplace has thousands of products. You can search results based on either commission, popularity, sales and gravity. You will find those stats at the bottom of the product information. Click on the red title and you will get their first sales page. Make sure this is professionally done and has good information. Once you decide on a product you will need to create a hop link. Click the green button beside the listing. A form will come up asking for your account nickname, enter the nickname you created in your sign up account information. Click create and Clickbank will give you a link. Whenever any one clicks that link they will be brought to the product you want to sell. If they purchase that product you will receive your commission. But here’s a warning, it’s best to purchase the product you’re trying to promote. That way you can describe it better and tell all of its advantages and disadvantages. Make sure you buy a product that is good and offers good value. But if you don’t like the product Clickbank products are covered by a 60 day money back guarantee. So you can return it and search for something else. And Clickbank has many tutorials to walk you thru everything. Next you want to set up a web site or blog about this product or products. Make sure your web site has a signup form or opt-in form. You will need to be connected to an auto responder such as Getresponse or Aweber. They have tutorials to help you get started. You want to collect people’s emails, so they can be on your list. As they say “the money is in the list”. Once you start building a list of subscribers you can e-mail them daily, weekly, whenever you have something else to promote. Make sure you are offering your subscribers valuable information. Your job is to inform them and keep them up to date on all the latest products available to them in that niche and to help them achieve their goals. There is no get rich quick scheme . This is just like any other business you have to work at it and not get discouraged. Wealthy Affiliate has a program for free, no strings attached. You receive two web sites for free and plenty of valuable information. They take you by the hand and help you get a business up and running. This is an extremely sophisticated program, but very easy to understand and use. 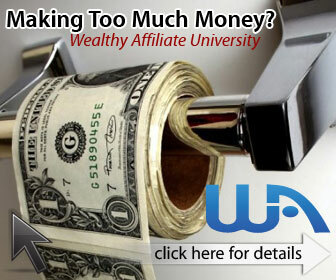 Check out Wealthy Affiliates and you will be glad you did and it’s free! If you would like to send me a comment or question please do so below and I will be sure to respond.